This Thanksgiving Reading Comprehension Article is the perfect Thanksgiving themed informational passage to teach children about the First Thanksgiving. 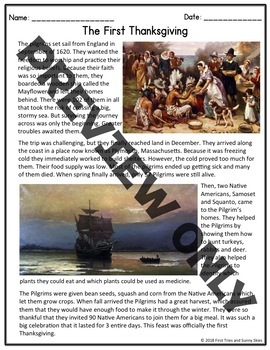 This Common Core aligned text also comes with comprehension questions including multiple choice and short answer (answer key included) . Best for Grades 4-6. Check out the preview to see what you are getting! ★Click to Follow Me to get freebies and updates on new resources! If you download this resource and ♥ it, please rate me!